Photographed near Vulture Peak, Maricopa Co., Arizona, USA. March 2008. ANNUAL: Low-growing and often rather small annual of spring. With very good moisture supply plants can reach 60 cm across; i.e. the plant is mostly prostrate. LEAVES: Compound leaves usu. 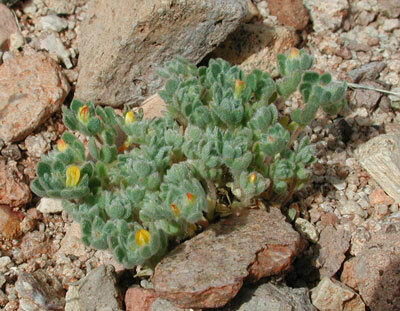 with a dense covering of soft hairs. FLOWERS: Small, bright yellow pea-flowers. FRUIT: Dry bean pods just a cm or less long and with a few minute bean-seeds. Just before maturity pods are reddish. RANGE: Frequent throughout the Sonoran Desert in Arizona and Mexico on rocky slopes and wash banks, but absent in years with inadequate rainfall.